With the holidays just around the corner, well-informed hosts know to book their caterers early to ensure the success of their parties and events. The right caterer can make or break a get together, so research and proper selection are necessary to plan the perfect gathering. Begin the process by defining the type of event you are planning - a sophisticated holiday cocktail party, a formal sit down dinner, a dinner and dancing extravaganza or a casual sing along or trim a tree. Once you have the concept, you are on your way. Next, select the date for the event, keeping in mind to avoid conflicts such as the first night of Hanukah, Christmas Eve, or the same day that others you are inviting may have a conflict. Now that you have defined the type of event you want to host, and selected a date on which to host it, it is time to think about the proper help you need. During the busy holiday season, engaging the outside help of a competent caterer will enable you to plan, and enjoy, your event. When looking for a caterer, reputation is a critical factor. Ask friends and colleagues for recommendations of caterers that they have used in the past. Think about parties you have attended where everything was "just right" in terms of food, service and display. Seek out the names of the caterers with a reputation for excellent food and service. Creativity and unique menus also make events memorable and are attributes you should seek out. Once you've identified your list, you can begin your research with calls to find out availability. When you have narrowed your list down to a few choice caterers who are available the date you wish to have your party, it is time to delve in and select just the right one for your needs. This involves interviewing the caterer, selecting and tasting menus, discussing theme and rental needs, working out beverage arrangements, agreeing upon price and service requirements/fees and always checking references. The first step is meeting with the caterer. Meet privately with the caterer at their place of business or kitchen. Do not agree to meet with the caterer while he or she is catering someone else's wedding or event. Why not? Yes, you may want to see him or her in "action", but this means the event at hand does not have the caterer's full attention. And, if they make a habit of meeting with prospects at other events, this caterer will most likely do the same to you during your holiday party. When you pay top price for a caterer, you deserve their full attention. Find out who will be your day to day and on site contact for your event. Be sure you feel comfortable with this person - you want an event manager who is competent and client service oriented. During your meeting, ask for a list of references that have used the caterer to plan similar events. Be sure to call and speak with these references - and do ask for their feedback. Never book a caterer who has not given you a number of references of satisfied clients who have recently used them. When selecting menu choices and serving formats ask the caterer for recommendations based on similar parties they have worked. For a formal dinner party, ask for a sampling of three or four course menu suggestions - from soup to salad, dinner and dessert. For a party based on heavy appetizers and signature cocktails (think red and green martini combinations) ask for a menu recommendation that will satisfy guests while still being finger food oriented. A more casual affair such as a neighborhood sing along still requires significant planning. Have the caterer suggest menus that are crowd pleasers such as warm winter soups, crisp salads with seasonal favorites such as cranberries or apple slices, warm cookies for dessert, and gourmet hot chocolates and coffees for after dinner. The menu is the cornerstone of any event, so make sure your caterer is using only the freshest ingredients. Inquire if the caterer uses all fresh food, or if any of the foods will be previously frozen. Top caterers always work with fresh food, and rarely will use canned or frozen ingredients. Additionally, don't be afraid to ask the caterer for special accommodations for some of your guests. Most caterers can provide a vegetarian option, a Kosher meal, or specially prepared children's selections. Also, be sure to tell the caterer about any food allergies that your guests may have-this will be important information for food preparation. Family traditions are part of the holidays. If family members are on the invitation list and they have certain "must have" holiday favorite recipes, do not be shy about telling your caterer. A good caterer will incorporate a family recipe into a menu should you ask. Using grandma's secret recipe or serving a family's ethnic foods are a wonderful way to personalize a holiday party. Once you have settled on the menu, it is important to taste it. 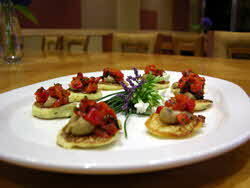 Arrange for a time to visit your caterer where they will have a tasting menu prepared for you. Taste and presentation are important. If you don't like something about the menu, the tasting is the perfect time to discuss it with your caterer. Remember, this is your party and details matter. A good caterer is there to work with you to ensure that the event is just the way you want it to be. When at the tasting, also ask to see photographs of the caterer's table displays. Some caterers who provide buffets or food stations include floral arrangements and other decorations within their fees and range of services. Ask the caterer whether he or she will be supplying decorations, linens, tables, chairs, plates, silver wear and other rentals. All top caterers have arrangements with reliable rental companies to provide the settings that you may need. Discuss the options available - you may have six stunning martini glasses at home, but are inviting twenty to your get together. Mix and matching what you already own with beautiful, coordinating rentals can often add flare to a party. Discuss your needs with your caterer - you want to ensure that you have the proper amount of service wear for your event, and that the look and feel of the party is exactly what you had in mind. Linens are available in a myriad of styles and colors. Shimmering floor length table cloths can add just the right touch of elegance. Your caterer will help you select just the right look, which complements your home or party venue, the food, and creates the ambiance of the event. Remember, rentals are typically an extra cost so be sure to get a through breakdown of anticipated and agreed upon expenses from your event manager. The next question is now -- What about staffing? If the caterer's price includes the cost of the meal and your place settings, does it also include staff for the event? Or do you need to pay an extra hourly rate? Different catering companies price their services differently, so be sure to ask. Make sure your caterer has experienced staff -- inquire how long their servers have been with the company. You might be surprised. Quality caterers will have experienced staff, and the difference in service will show. Additionally, catering staff should also be properly attired so no one mistakes them for guests. Ask the caterer how their staff will be dressed at your event. And last, but not least, staff should look like they are enjoying themselves. A simple smile goes a long way. Another question to ask is "How will the meal be served?" Passed, plated, buffet? If you are having a buffet meal, is the buffet going to be served or do guests help themselves? These days, served buffets are very popular but be sure the caterer comes prepared with an extra 10 per cent of food - just in case a guest takes a larger portion or helps themselves to seconds. Additionally please discuss drinks and alcohol. Most caterers will provide a bartender (and often insist upon liquor liability insurance for each guest). Alcohol is typically a separate charge. Be sure to go over exactly what you want served - for cocktails, what level of liquor do you want poured? Top shelf? In terms of wines, be sure to approve the bottles that will be poured..a lighter pinot gris for a luncheon, an oaky chardonnay with dinner, a robust red to accompany a hearty stew..the wine needs to complement the meal. Always have ample supply of non-alcoholic beverages available as well - flavored sparkling waters, sodas, coffees and teas. A good caterer will be licensed to serve both food and beverage in your home, and will most certainly help you pair the proper amount and type of beverage with your meal selections. Finally let's talk about price --- What does the total price include? Be sure you have a detailed breakdown of food, rentals, service fees and gratuities, beverage and tax. Ask the caterer if the gratuity for the staff is included in the overall fee - or are they expecting a cash tip the evening of the event? Be sure to have a contract. This way both parties understand explicitly the terms of the event. Review the contract for date, time, and guaranteed number of attendees. Up until what date can you add or delete guests from the contract (important information in terms of your RSVP date). Come to an agreement on all fees, gratuities, sufficient insurance, extra charges, payment schedules, and cancellation policy. Caterers often quote prices based on a certain number or minimum number of guests. Keep in mind a caterer may base an estimate on a minimum of 100 guests, so if you only have 80, there might be an extra fee. A standard is 50 percent as a down payment, with the balance due at a later, specific date. Having a good idea of your budget is crucial when picking a caterer. The fees and extras add up quickly so be prepared for them, or have a contingency plan. For a less formal get together, you may determine a buffet will cut down on service fees. You may select less expensive liquors or wines to be served. Remember, these are the details to work out with the caterer well before the actual party. Preparation and communication are paramount between you and your caterer to ensure an event which will work well within your budget. Working with a good caterer will enable you to host a party that will be enjoyable for all - most especially you! These tips are general guidelines that today's top caterers are trained to follow. A good caterer will be delighted to review these areas and work with you as a team in hosting a memorable and well-executed event. 12. Know your budget and know what is included in the caterer's estimate.